Whether you are an experienced Optimist sailor or you just start racing the Optimist, it could be hard to choose which type of Optimist spars are most suitable for you. You learnt sailing the Optimist with school spars and now it’s time to make the next step. When starting the search you will immediately recognize a visible difference between school and racing spars. An Optimist racing mast is fitted out with a halyard hook-in block and a wind indicator which is fixed by using top pins. Besides the visible aspects, the main difference is the use of material. Blackgold racing spars are made of high quality 7075 hard anodized black Aluminium, which makes them more durable and stiffer than school spars which are made of more ‘standard’ Aluminium. 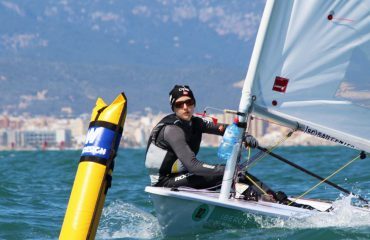 Now you know where Optimist Blackgold spars are made of, it’s time to choose the right configuration; you might noticed that several different types of masts, booms and sprits are available. We explain the difference. The Blackgold collection contains two types of Optimist spars. The regular BLACKGOLD™ mast which is suitable for sailors above 40 kg and the 25% lighter BLACKLITE™ mast which is the best proven solution for sailors under 40 kg and allows sailors to depower the rig in heavy winds. Both are 45 microns black hard anodized 7075 masts and come with high grade nylon fittings, hard anodized cleats and complete rigging pack. Three types of Optimist booms are available. 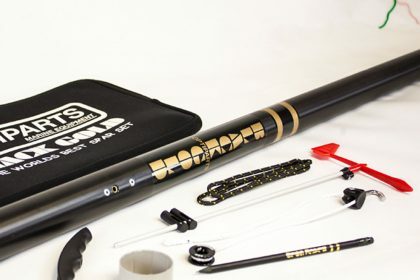 All BLACKGOLD™ booms are made of high grade, black anodized tube, fitted with captive eye straps, black nylon in- and outboard end fittings, nylon outhaul cleat, 4 mm Vectran outhaul, 3 mm pure Vectran bridle and vang and a fitted outhaul trim gauge. 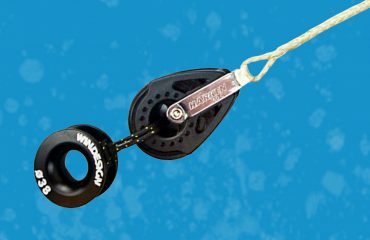 BLACKGOLD™ MEDIUM – A stiff 40 mm lightweight Optimist boom which is suitable for the majority of Optimist sailors. BLACKGOLD™ POWER – A stiffer 45 mm Optimist boom to keep more tension on the leech for the heavier Optimist sailor. The smaller bridle gives more space when tacking. BLACKMAX™ – This ultra stiff and yet lightweight 55 mm Optimist boom can be used without a bridle. This enables the larger Optimist sailor to land further forward when tacking. We offer a choice of three black anodized 7075 Optimist sprits. All with black end fittings and sprit chafe guard. The 26,6 mm BLACKLITE sprit is 20% more flexible and a lot lighter than the 27 mm BLACKGOLD sprit. The 29 mm BLACKMAX sprit is 19% stiffer than the 27 mm BLACKGOLD sprit and recommended for Optimist sailors above 45 kg. 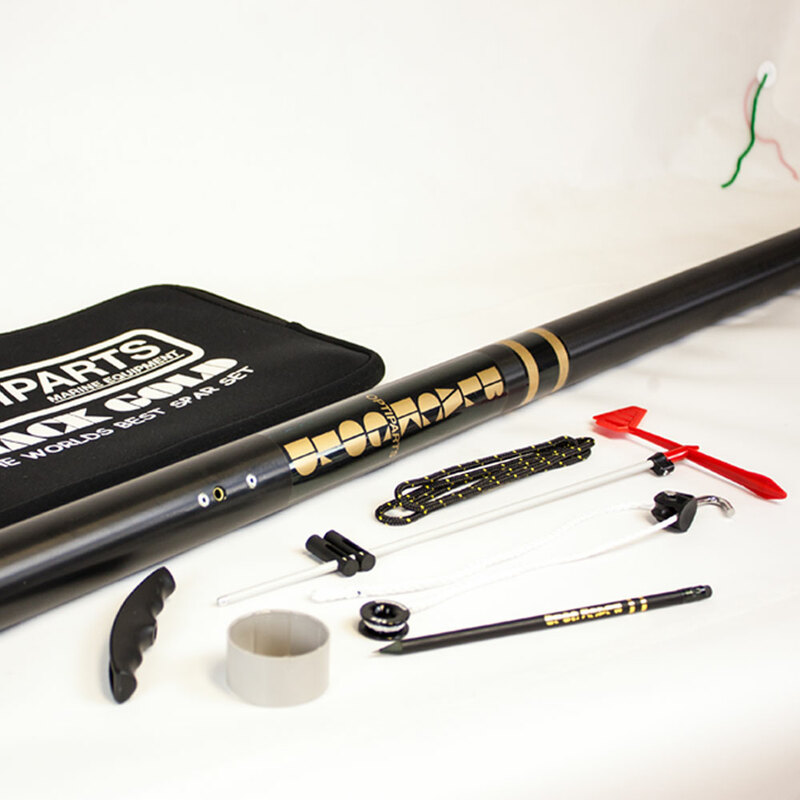 The combination of the different types of masts, booms and sprits creates the Blackgold spar sets, which are suitable for most sailors. Please note that Optimist sailors sometimes choose a personal configuration, like a thinner sprit or thicker boom. This could depends on the sailors style and is mostly advised by a coach. Besides Blackgold racing spars there is a more affordable racing spar set available for the Optimist, known as the Silver Regatta Spars. It’s built according to the I.O.D.A. Class rules and the price is comparable to the school spars. The Silver regatta spars are less stiff than Blackgold spars and ideal for lightweight Optimist sailors who just started racing. The Silver mast, boom and sprit are made of high quality aluminium tube, fitted with aluminium halyard and downhaul Clamcleats. The lightweight 40 mm silver boom is much stiffer than the 32 mm school boom and will allow the sailor to put more tension on the leech. The Silver sprit has 15 cm anti chafe protection tubing. Both mast and set come with rigging pack, containing all necessary lines, wind indicator, top pins and halyard with hook-in block. 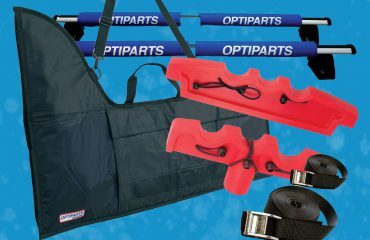 If you have any questions, we advice to contact an Optiparts dealer. Please fill out our contact form. We will respond as soon as possible with details of your nearest dealer.